One of the world's foremost experts on algae blooms is in Tiburon studying what is making the Dungeness crab off limits to humans. TIBURON, Calif. (KGO) -- By now, we know that the Dungeness crab season has been delayed and we know the reason a toxic acid produced by algae in warmer, El Nino waters. One of the world's foremost experts on algae blooms is in Tiburon. We learned this algae does not always produce the toxic acid, but when it does, watch out. 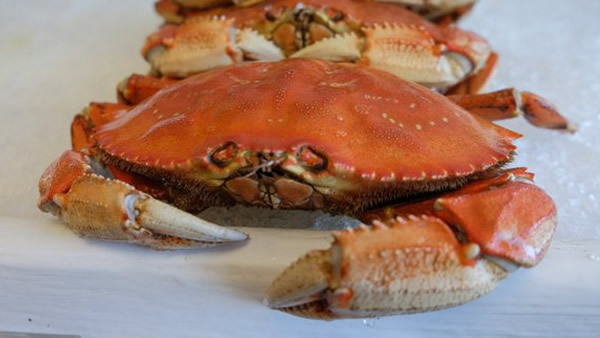 Scientists are worried about much more than Dungeness crabs right now. At the Romberg Tiburon Research Center, the laboratory is researching a small critter with a name much longer than its length, at one millionth of a meter. It's called Pseudo-nitzschia australis. That name may be new to you, but not the damage it's causing. The algae can produce the toxic domoic acid that has moved up the food chain into the Dungeness crabs we had hoped to be eating by now. San Francisco State University researcher William Cochlan, Ph.D., is the chief researcher trying to learn why the algae produce that acid. California officials delayed the Dungeness crab season just days after warning of dangerous levels of a neurotoxin linked to a massive algae bloom off the West Coast that could make people sick. "It is producing this toxin because it is giving itself some sort of competitive advantage," Cochlan said. However, the algae doesn't do this all the time, we might add. This year the algae are producing the acid and proliferating in warmer El Nino waters. "It is well beyond crabs. It has a completely destructive effect on the whole marine ecosystem," Cochlan explains. What we see this year has happened before, though this time, it's stronger and more widespread. Events like this are happening more frequently than we've seen in millions of years of geologic records. "If you go back far enough, you see conditions that were worse than today, but you are talking about the dinosaur period," Larry Madin, Ph.D., from the Woods Hole Oceanographic Institution, said. Hence, some of the changes we're seeing, from species appearing far beyond their normal ranges to algae blooms inadvertently contaminating crabs and filter-feeding shellfish. "At stake is the health of the marine ecosystem..." Cochlan said. And most of us were simply worried about our Thanksgiving dinners.